A solid 6 feet off Boneyards, unloading 50-yard sections before moving into the magic alley known as Supertubes, right where two surfers sat, freaking out of their minds. Airbrushed lineups of perfectly symmetrical Supers, with offshore tubes stacked to the horizon, fire red sunrises and humpback whales breeching in the distance. Add a couple jerseyed surfers to the canvas, and those 2005 Billabong Pro memories come to life. As if yesterday, sort of. 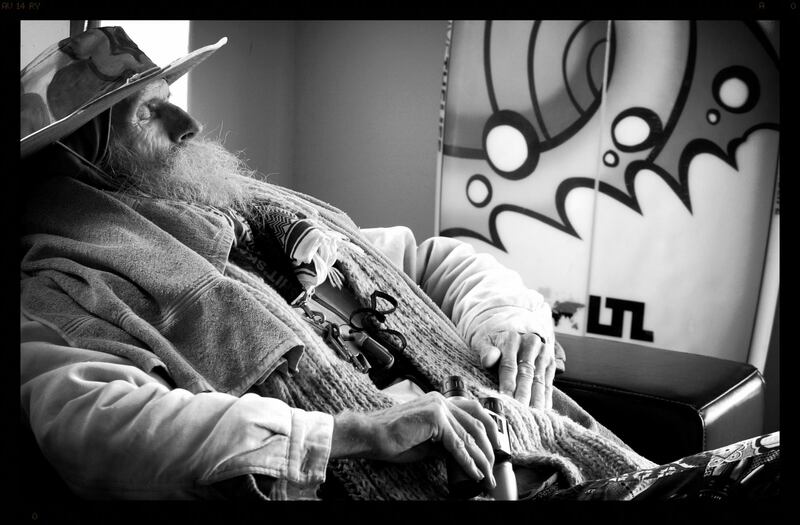 A smokey bar is filled with surfing icons. The King is rumoured to sing with Donovan Frankenreiter. (Kelly never shows up, probably was mind surfing his upcoming finals against Andy) .When suddenly hypnotic blue eyes steal the show. 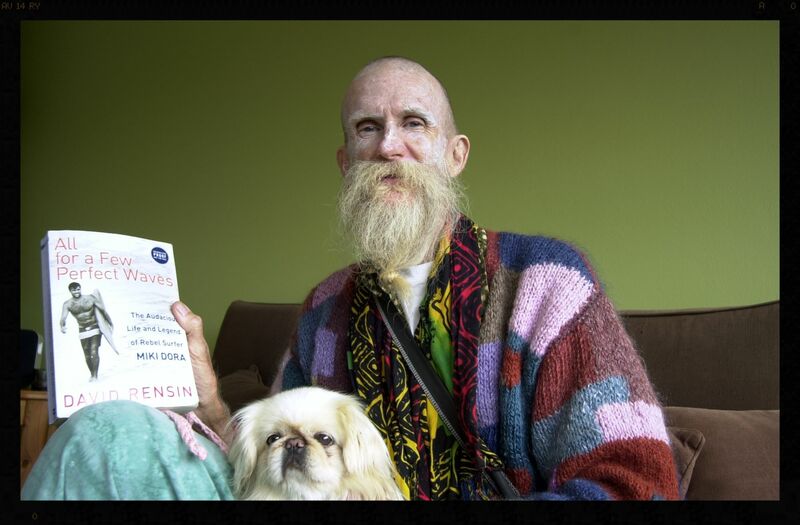 Spotlights turn his blonde-greying beard into Gold. Shells bejewelling his lofty frame. Charisma spreading all over the place. Slightly starstruck. Donovan amplifies the magic. Dance moves are re-invented. 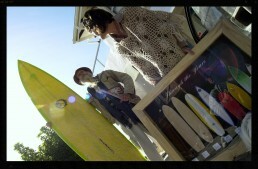 Gold is said to be vexed by the nature of professional surfing. But that night it seemed like a match made in heaven. Marriage might be the enemy of surfing freedom a bit of dancing and flirting can’t hurt. Some call him the town’s last true hippie. Maybe. 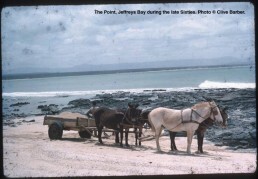 As much part of J-Bay as the pelicans and dolphins ? For sure ! Maybe Bruce is one of J-Bay most recognisable throwbacks to that golden era when wild-eyed younsters descended on the Eastern Cape seeking the perfect wave. Yet he is not alone. 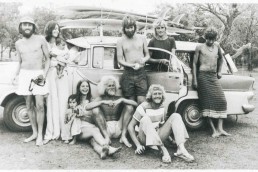 Other veterans blazed the trail in the late 1960’s and 1970’s to make the town one of the most prized surf destinations. 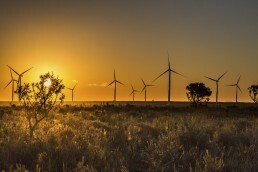 Though their numbers have dwindled during the last decade. Bruce first came here in 1953 with his family but never returned till the end of 68. He ended up staying longer each time. It started with a 6 week surf trip while still loving his taxi driver job in Natal and later giving five Rand massages in PE (Port Elizabeth). Bruce’s wave knowledge, honed over four decades is obvious. He trims effortlessly through the racy Supers sections, his arms often raised in a soul-arch salute. Sustaining his bohemian lifestyle by selling bottled mini shells that he picks up on the beach. 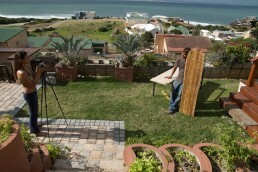 Or his 70’s docu Shaloha and the DVD Oceans Under Threat by Mike Van Vuuren. Often he gives them to people he likes. 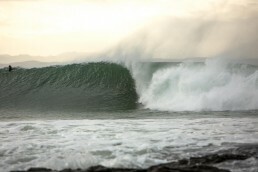 Such a good vibe, so many all-time stories to tell, no wonder Bruce can always find a hot meal in J-Bay. 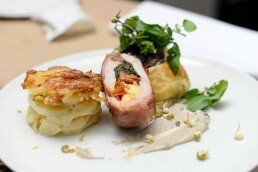 But during the 5 years we lived together he was always busy making his own healthy food. Fruit & Veggies his daily menu. His every-present “Scooter Girl” at the heel. The Pekingese was a reference to Miki Dora’s King Charles spaniel “Scooter Boy”. Named for the famous 1940s Waikiki surfer Joseph “Scooter Boy” Kaopuiki and his surfing dog Sandy. Bruce was one of the people he could relate to. No wonder. Always ready for some fascinating conversation. With adolescent excitement . A millionaire in memories with few possessions. Besides a museum worthy collection of shells and surfboards ranging from a rare Midget Farrelly Single fin to a Joel Tudor fish. 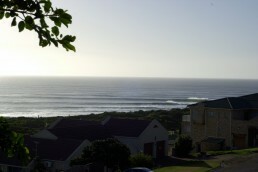 Bruce Gold tends the J-Bay Surf View garden overlooking the bay, smiles a toothless grin and a gloved hand taps the box containing some possessions of Miki Dora. “Should we auction it”, he joked. “Dont sell me out”, were Mikis words. Pandora’s box still locked up, not to be opened. 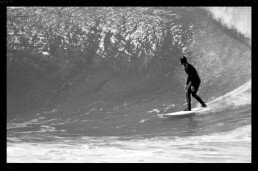 Tony “Doc” Van Den Heuvel wasn’t the first person to surf Jeffreys Bay, but there is no doubt that he surfed it the longest. In the early sixties, Tony was the original South African competitor and by the late 60’s he was the original South African rebel. 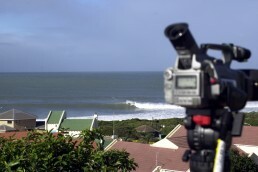 For most of his surfing life, he has gone against the grain of the Afrikaner establishment in Jeffreys Bay. He was a boot maker and that gave him financial independence and endless hours of surfing with only himself to answer to. The passing of his treasured dog Faith left a void in his life that was never filled. 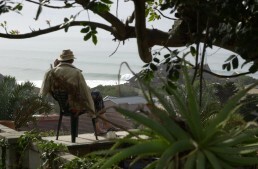 His gaze was that of a surfer who has seen it all, since he first surfed J-Bay in 1962. He is now sorely missed. Bruce Gold, Christine Moller and Shorty Bronkhorst. All three being Doc’s true ‘partners-incrime’. A lifestyle, an attitude and interpretation of living to surf, staying on the beach and staking claim and right to live and die on the dunes overlooking one of the worlds most iconic surf spots. Think about it, to be able to stake your claim to a piece of prime surf real estate and get away with it, you’d have to have lived a life like Docs. Christine and Doc were two of SA’s first representatives charging the North Shore of Hawaii, whilst Bruce and Shorty go as far back as surfing itself and have shared Doc’s path. Shorty passed away at Humansdorp Hospital. He was one of the original South Beach crew who lifeguarded and surfed in the late 1940s to 1950s. He was one of three South African lifeguards — with Cliff Honeysett and Bobby Burdon — who hitch-hiked through Africa, fending off stone-throwing monkeys in the Congo, surfing at Alexandria in Egypt until finally introducing surfing to the English Channel island of Jersey in the mid 50s. 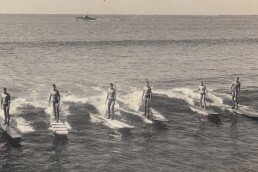 He was a founder of the Jersey Surfboard Club in 1959, returning to the island 10 years ago for the club’s 40th anniversary. 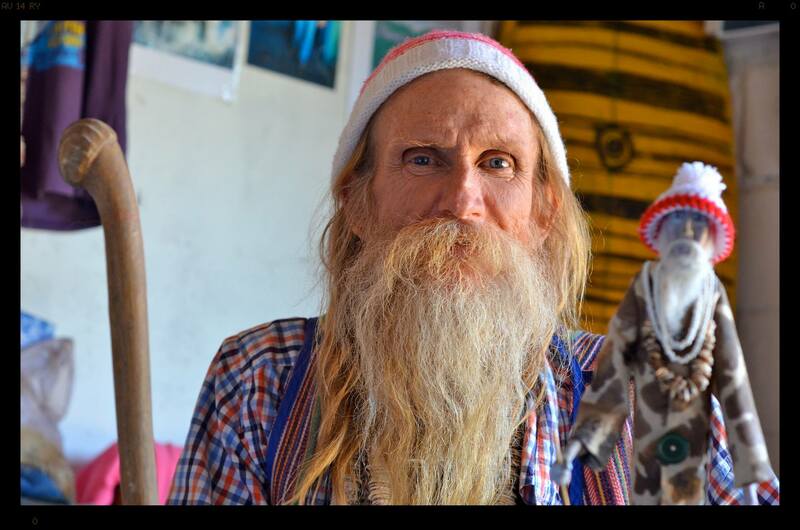 He worked with Atlantic Waves surf school and inspired a generation of grommets with his boundless energy, love of surfing and tales of the Skeleton coast. 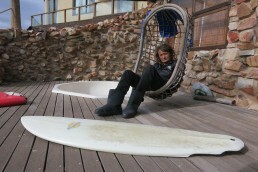 Shorty moved to J-Bay 15 years ago to run the Salt Rock Lodge. 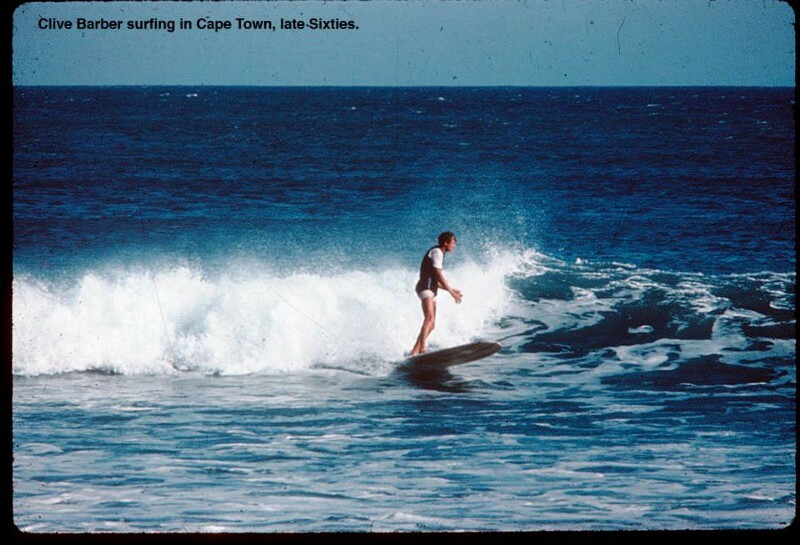 He was a fixture in the water and never missed a good swell, often hanging out at ‘the office’ under the Supers boardwalk with cohorts Ant van den Heuwel and Bruce Gold. 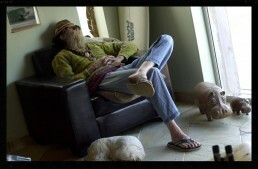 Shorty will be sorely missed by all his friends and family in J-Bay, South Africa and the rest of the world. Rest in Peace Shorty, Hamba Kahle Mfwetu! 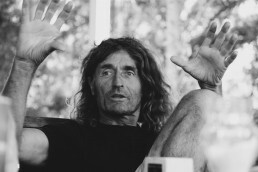 Clive Barber not only made one of South Africa’s first surf movies, African Vibrations, he was also an intrepid photographer and traveller who documented his journey around Australia . 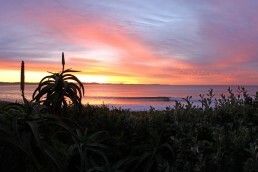 There are many iconic images from Byron bay to Mauritius and all over South Africa. AL: You and Doc were cruising together on you first trip to J-Bay, right? 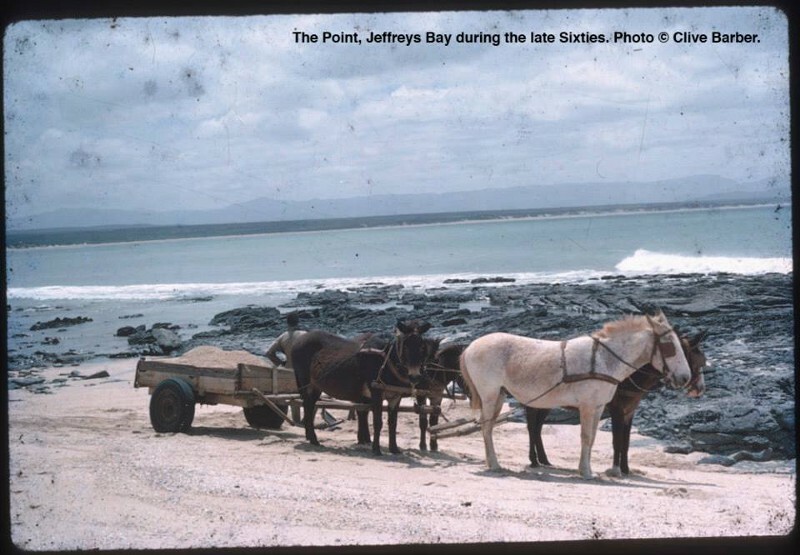 Shorty: It was in 1966 when he came back from competing for South Africa in Peru and ah, we actually did a trip to Cape Town and stopped off here in J-Bay on the way, and then stopped again on the way back. Then I had to get back hey and Doc said “Im staying a bit longer!” (laughs) and of course there was nothing here I mean not a house in sight. We all camped in the dunes down the bottom of the point. AL: What was the story with Doc when they wouldn’t give him his Springbok colours? AL: What do you reckon Christine? Christine: “ Well, I also knew Tony since he was sixteen. It was during the Durban Lifesaving Club days, he was with Pirates and Shorty was at South Beach then Tony became a pro lifeguard as well. AL: So then how did you two end up meeting in Hawaii? Christine: I was over there from California and he came over from South Africa to stay and surf the North Shore, it was before all the contests started happening. Just before we left they started having one or two events, it was around ’66 i think. Christine: Charge what? Oh, (laughs) well I guess he did — I think we were all were surfing like crazy in those days. AL: Were you guys like partying hard? What was the whole Hawaiian social scene like back then? Did you guys chill out in hammocks and drink weird smoothies or what? Christine: No, it was quiet, I mean we’d go home, make dinner, go to bed n’ get up early the next morning! There was no nightlife, there were some youngsters from San Fransisico and they got a light show going in Honolulu, that was about it. AL: What about that really solid wave Bruce was telling us about that you and the Doc shared at Sunset when it was big? AL: What was the story? Christine: I dunno, the waves got bigger and bigger the way I hear it! 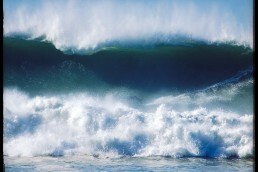 (more laughter) I don’t think they were that big, I dunno I suppose you don’t think about it when you’re young and strong, you just go out there and you surf! AL: Young and stupid hey? Just like me! Bruce, where and when did you first meet Doc? Bruce: End of ’68 hey, right here at the point. AL: Were you guys camping or what? Bruce: Ja, we came out here on a surfing trip and Doc was staying here in a half a bus, half a silver bus. He’d been here for a while. He had a sore back from doing a flick-flack on a tiny green 5’6″ surfboard, I even saw him shaping a board on the beach with some Aussie. 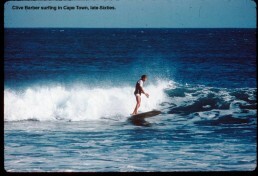 Gavin Rudolph rode it the first time, I remember that was J-Bay in 1968. AL: How would you describe Doc’s style of surfing? Bruce: Very controlled, very powerful. 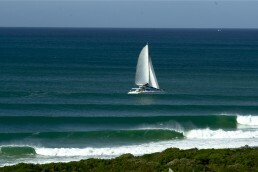 Precise and considered surfing, stylish. AL: What era suited his surfing best? Bruce: Longboard surfing for sure. Mickey Dora came back here and he only rode longboards and he inspired us more or less to stay on the longboards. AL: Tell us a cool story about the Doc. It was around ’92 when I first heard from an Aussie that the infamous Doc was on the scene again, having moved out the Pellsrus township. 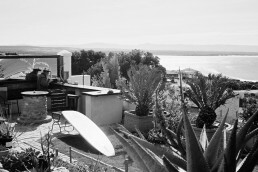 Staying at Koffie’s Surf Camp keeping the coals blazing around the fire and telling the tourists surf stories. I had to see it for myself and thus started my friendship and ‘tutelage’ with the Doc, Supertubes and the politics of Jeffreys Bay. Since all I’d ever heard through grommet hood was the name, like he was one of the pioneers of J-Bay or something, respect came naturally. You see Doc was as respected as he was hated at times. 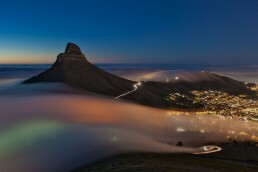 Animo-city is not a place in Disneyland, it lives and breathes in the lungs of spoilt antagonists in towns just like J-Bay. Doc lived the way he wanted, which was not without confrontation. 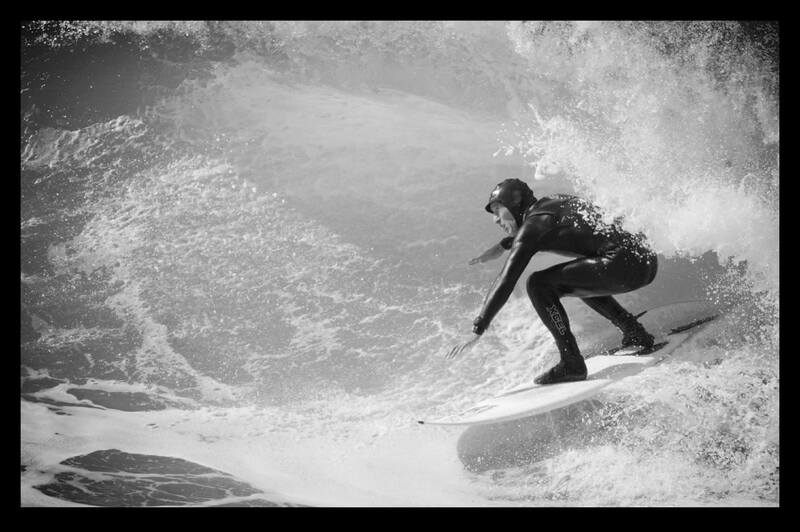 Negativity as a result of his actions, habits and attitude came and went like the tide, like the two sides of Doc; one unequivocally cool, the other on edge, disillusioned and angry at the way things had become with the scene, crowds and the reckless overdevelopment of J-Bay. Physically, at 59 ripe years of age it was a challenge to camp in those dunes. For a while he had his dog Faith and then Socks and all the crew in the ‘office’ under the boardwalk and things were rocking. Tight people, good times and bad. I’m sure a heap of us have spent many a day watching the show between sessions; Christine knitting Bippo beanies on one side, Bruce doctoring the Doc’s back on the other while he grooved to his radio, crafting leather boots and sandals and dogs and pups ran around your feet like crazy! Doc’s work was renowned the world over, check the old Art Brewer photo of his thigh-high Ugg boots, custom built for the infamous Bunker Spreckles, not to mention Mickey Dora’s politically incorrect sealskin boots! (Still in the possession of one B. 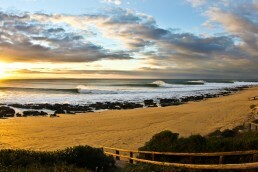 Gold) You just had to have patience and order your boots long before you left J-Bay. 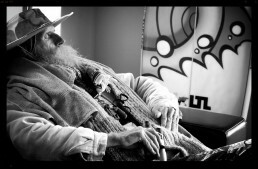 And so he eked out a few bucks from the leatherwork, did some interviews for surf mags and generally survived in a style one could only survive on in a place like J-Bay with its history as a surf-travel mecca and international meeting place for all forms of tube riding. Exploding orange aloes. Clusters caffeinated surfing addicts. The wooden boardwalks on the dunes overlooking the point. Freshly repainted, carved with stories worth telling. 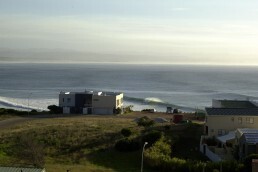 Bruce Gold’s presence still like a part of the whole J-Bay package. The wave still as good as it gets. Aren’t we all just a bunch of escape artists on the prowl for fun anyway ? 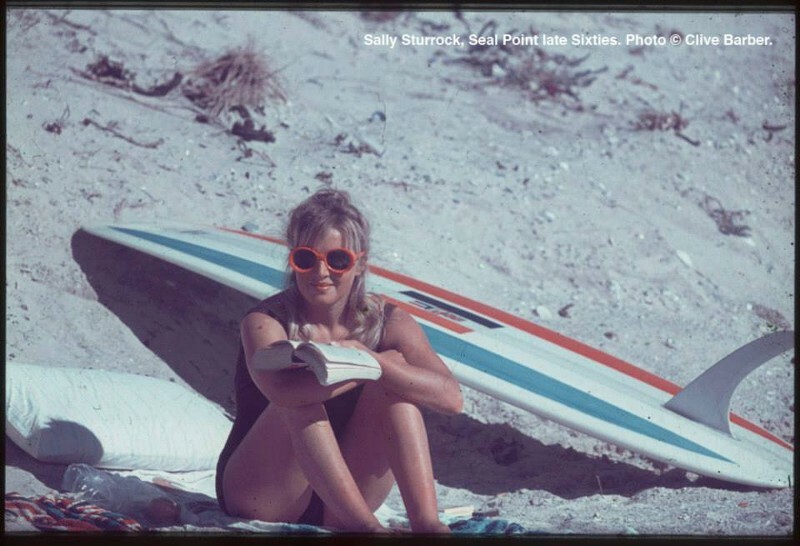 “You can spend your hole life trying to figure out how to make a million or you can spend your time doing what you love and what you’re good at!” — Doc quoted in South African Surfer magazine, 1970’s. Take note Bruce would say. Life’s a bargain, cheap at any price.